Att. : Generally it’s important that we separate the voip traffic from the data traffic so we’ll utilize two different VLANs: one VLAN will carry the data traffic destined to the desktop and server and the other will carry only the Voip/voice traffic. The Voip PBX it is connected with another ethernet card directly to WAN/Internet, to have the maximum perfomance and quality for Pbx Voip trunk connected to ITSP (Internet Telephony Service Provider). In this manner all the phone and other device in Voip VLAN can use directly the Asterisk server like gateway to have internet access (you have to configure iptables accordingly). Another solution can be to use layer 3 routing directly inside the switch, but in this case I preferred use this solution. Att. : Of course it is mandatory to configure carefully the firewall inside the asterisk linux server ! In the same linux server we can configure DNS and DHCP server for Voip VLAN. Here we’ll use only 1 switch port to connect desktop and ipphone. 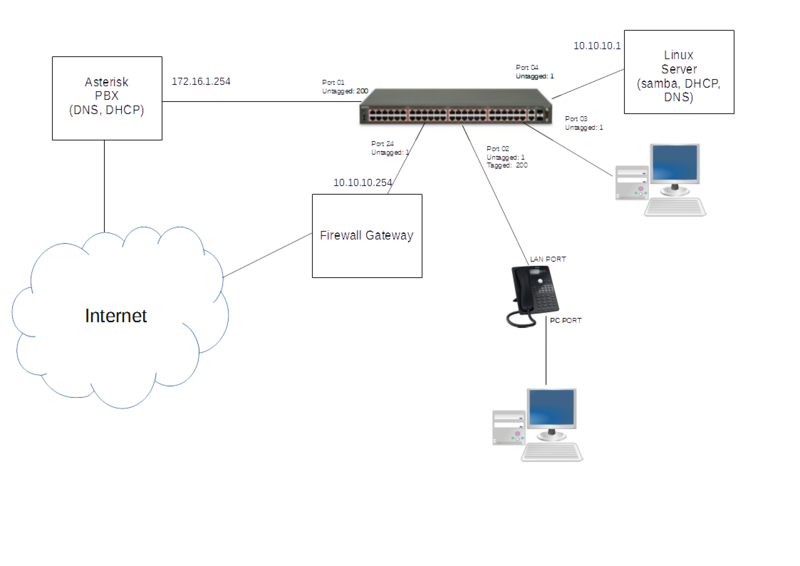 Snom ip phone have 2 LAN plug: one to be connected to switch (named LAN port) and the other to desktop (named PC port). There are some special considerations when desktops are physically connected to the PC port on back of an IP phone (in our example Snom ip phone, but with other models it is same) and then the IP phone is connected to the switch: in this scenario the common approach is to tag the voice VLAN while leaving the data VLAN untagged. The desktop won’t be configured for tagging so it won’t understand an 802.1Q tagged frame (in our case VLAN 200): when the desktop will receive a tagged frame will just discard. The IP Phone will be configured to use only tagged frame (VLAN 200), and the other frame received in LAN port will be re-transmitted to pc port. The asterisk server must be able to reach the Voip VLAN directly without using any tag. Here the desktop is connected directly to the switch, and must be able to reach only the data VLAN. This entry was posted in Avaya, Hardware and tagged Asterisk, Networking, Voip by Giampaolo Tucci. Bookmark the permalink.